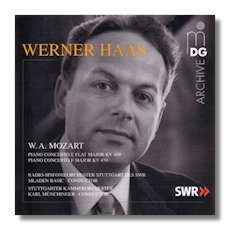 These South West German Radio recordings feature the late lamented pianist Werner Haas in music that was extremely dear to him, Mozart's piano concertos. He brings poetic beauty and well informed tempos to the music with particular effect in the lovely Andantino of KV 449. Although the rather unknown Mladen Blasic conducts effectively enough this concerto does sound rather earthbound at times. The prolific Karl Münchinger is in a class of his own, conducting KV 459 with majesty and ardour that befits this grand piece of music. Haas matches the orchestra perfectly, judging his entries with an uncanny sense of rhythmic vitality. It is indeed a performance to cherish. The sound dating back to 1965 and 71 respectively can be a little rough at times but the German engineers knew how to balance as has always been the case. At 50 minutes, this is rather short shrift but with performances of such stature, you will not be disappointed.